I have still been playing around with cutting concentric rings to make bowls and vases. I cut this oval bowl tonight and I thought some of you might like to have the pattern. This bowl turned out a little plain for my taste. I'm going to play around a little more and see what else I can come up with to add something to it. 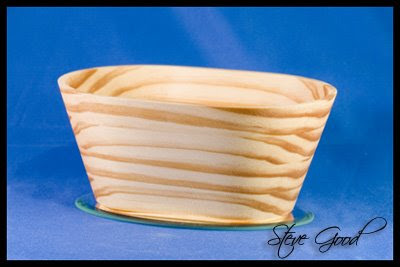 The bowl stands 3" tall by 5" wide and 7" long. You can cut the bowl from 1 board that is 5 1/2" x 8" and 3/4" thick. It's a good way to use up leftover scraps from other woodworking projects. If you need help in understanding how to cut this bowl watch the video on the concentric vase I posted last week. It explains how to drill the starter holes and cut the pattern.